Youths Participating in "Water Caravan"
Every year, the rainy season means water borne epidemics spread across the country causing severe illness and death to thousands of people in rural and urban areas. 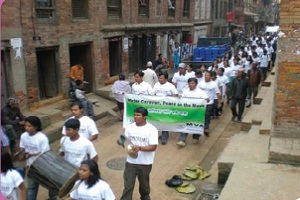 This year however, a preventive campaign called the, “Water Caravan” has been launched in the capital, Kathmandu to raise awareness of this issue. “Prevention is better than cure, which is the main motto of this campaign,” says Anil Sthapit, the director of Guthi, an NGO that works on media advocacy and youth mobilization. Three-month campaigns to help communities meet basic needs include educational fairs, training on water and sanitation, exhibitions on water testing techniques, street dramas, art competitions and peace races in each 10 strategic locations of the Valley’s five municipalities. 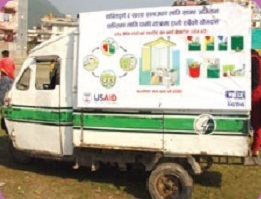 “Water borne diseases such as diarrhoea, typhoid, and dysentery are reported every year,” says Prakash Amatya, the director of the NGO forum for Urban Water and Sanitation, one of the campaign’s organizers. “We aim to minimize it by half this year. There is a strong need for behavioral change along with awareness among urban residents.” To help implement the campaign, the US Agency for International Development (USAID) has supported the initiative with 3.8 million rupees of financial aid.